I'm Julian Asamer, an Austrian strange-music listening pastafarian objective-c coder, and this is my website. Look around! You'll find information about some of my apps in the projects section. I'm currently programming on Photoboard, a neat photo viewer, in cooperation with Cedric. You may, of course, also select other backgrounds. It's not finished yet, it'll be easier to see the fixed numbers once finished. Now, that I've got two new apps for the iPhone out (take a look at them in the projects section! ), I decided to actualize my homepage. You'll find all pages in English and German now; The blog will be English only from now on. Alle Infos gibts jetzt unter Projekte/Fractalicious. Heute ist das Projekt eine Woche alt, ich erlaube mir einen kurzen Rückblick. 2091 Zeilen Code sind entstanden, also ca. 300 Zeilen pro Tag. Ich habe vieles in Objective-C, CoreGraphics und UIKit dazugelernt, beschlossen beim iPhone-App Contest mitzumachen und mit mehreren sehr netten und hilfreichen Amis geschwätzt. Im Programm selbst hat sich natürlich auch einiges getan: Der Mainview steht, es werden schon das obligatorische Spiralenfraktal und das Farnfraktal berechnet. Man kann via "real pinching" (wie ich es nenne) das Fraktal zoomen, bewegen und sogar drehen. Und das ganze dank CoreGraphics erstaunlich rund. Außerdem funktionieren die DragablePoints schon; dh. man kann, indem man Punkte herumzieht, das Fraktal ändern. Ich habe das Projekt gerade gestartet, mehr Infos dazu gibts unter Projekte/Fraktale. PS: Ich bin noch nicht sicher wie ich des Programm endgültig nennen soll. Vorschläge sind willkommen! Falls jemand einen Bug in der Website findet, den ich beheben sollte, schreib' ein Kommentar auf diese Seite. Ein denkwürdiger Augenblick: Der erste Blogeintrag! Endlich, eine mir angemessene Seite - ich bin recht zufrieden damit. Ich habe natürlich unter Projekte/Websites genauer beschrieben, was dahinter steckt. Was jetzt hier in Zukunft eigentlich geschrieben werden wird? - Ich weiß es selbst noch nicht so genau. Jedenfalls werde ich die schon vorhandenen Kategorien mit meinen Werken füllen und sie natürlich auf dem Laufenden halten. Möglicherweise werde ich auch meine Meinung zum FSM, Jesus, dem Papst, oder irgend welchen anderen Leuten kundtun. Call a Rep will re-democratize Germany. The ambitious app is currently created by Falko Blumenthal (idea, knowledge), Michelle Krack (design) and me (development). For Falko's crisp and clear description visit Call a Reps blog (German). 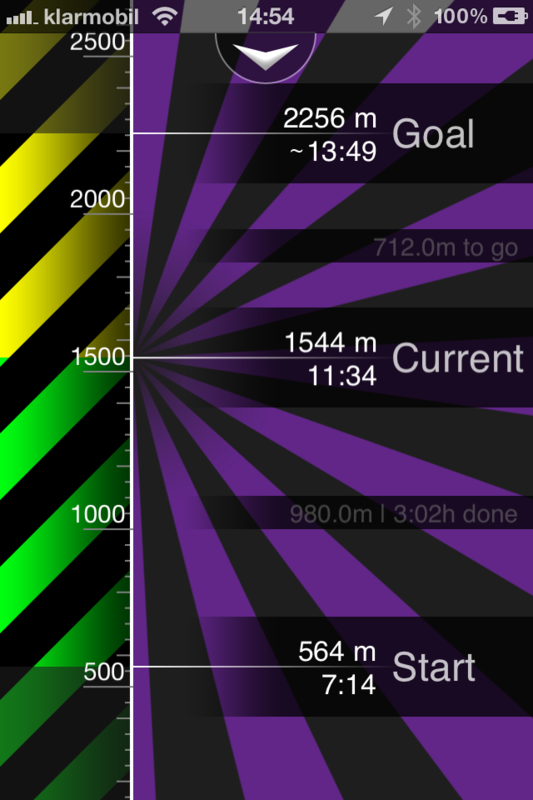 Heightmeter is an app that displays your current altitude. Click here to show a screenshot. You can download HeightMeter in the iOS App Store. If you discover any bugs or have feature requests, drop me a line. Photoboard is a multitouch picture browser I develop in collaboration with Cedric Villa. 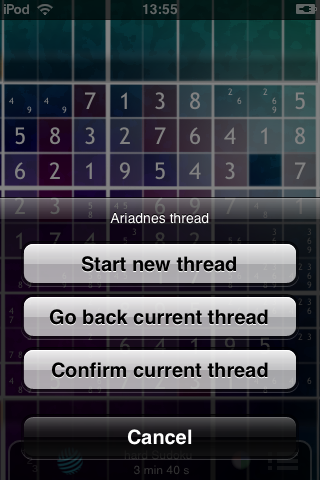 Version 1.2 for iOs 4 (iPhone, iPod touch and iPhone) is currently in active development. You can find it at fractalicious.googlecode.com. 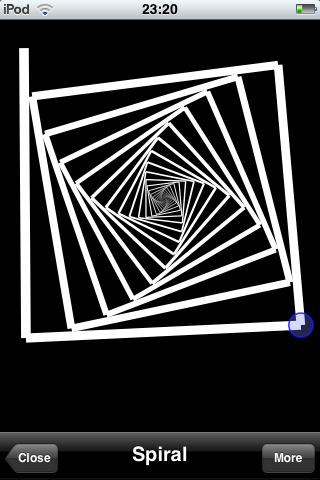 A variant of the "Spiral"-fractal on my iPod. Dragable Points - those are control points of the fractal; you can move them by dragging and change proportions & angles this way. The vector library is ported from FraQtal. 9. October: got my iPod! 14-17. October: installing the toolchain. 18. October: First hello world: I'm a iPhone developer from now on. 20. October: A base is working. 23. October: Math library working. 24. October: Introducing real pinch! 25. October: Generalized structure, Fern fractal. Requirements: An iPhone or iPod touch with iPhone OS 2.0 or later. One can, of course, enter notes. Ariadnes thread: You can use backtracing with this technique. Colorisation: You can set colors. 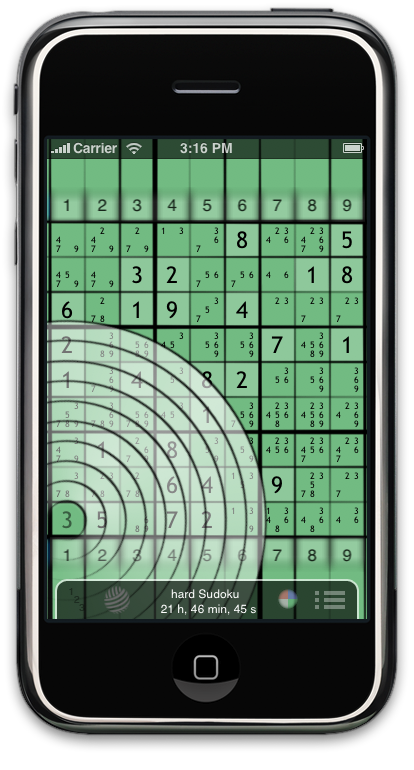 Error correction: You can let thumbSudoku correct your mistakes. 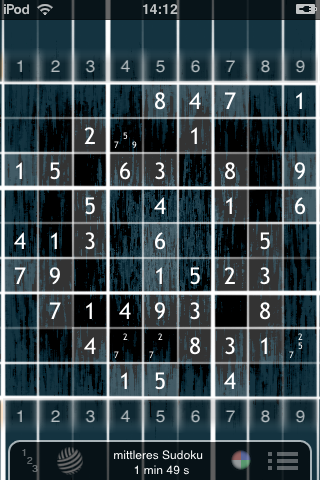 Note modes: thumbSudoku can enter all notes for you. Scan support: Scan for numbers quickly if you want to! Tips: A hand ful tips to get you started quickly. It's only two bucks! Imagine that! 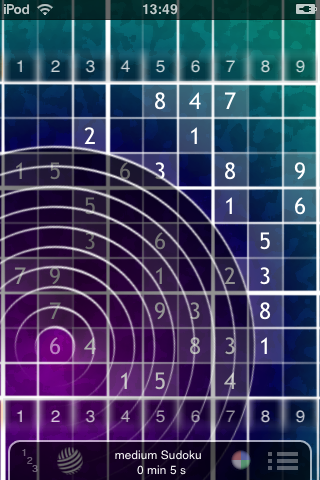 Screenshot: Entering a number the "drag-way" (the innermost ring is the 1, the outermost a 9). Screenshot: Using scan-support for the 3. And that's not all. 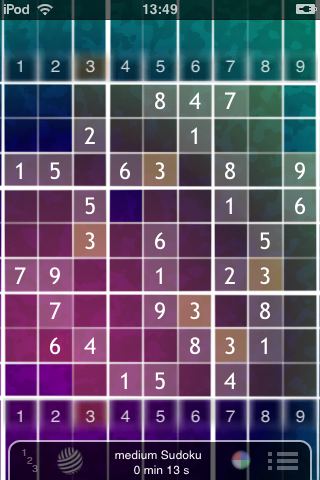 thumbSudoku is still in development, an update featuring more and harder Sudokus, a new theme, and a few other features is on it's way! UniCon is a simple, free unit converter. It features many important units of the categories Area, Currencies, Energy, Temperature, Length, Weight, Speed, Pressure, Power, Volume and Time. The currencies are checked on each launch; if they were not downloaded yet or if the are older than a day, they will be downloaded from the internet. That's how unicon looks when launched. Originally created in September 2007, hosted on jasamer.cwsurf.de, moved to jasamer.com on June 2010. This site is only loaded once, all other contents are requested via Ajax. I created over 250 images for this site - damn that was tough. It's php base is very easily extendable to support multiple languages. Check out the image viewing function.